HomeDomestic Violence ServicesIs there violence in your family? If you are abused, FAMILY Domestic Violence Services staff members and volunteers are here to listen to and support you, and advocate on your behalf. If you are abused, there are steps that you can take to protect yourself. Check out these signs of abuse to learn how to recognize a pattern of abuse. You are not alone and you are not to blame. 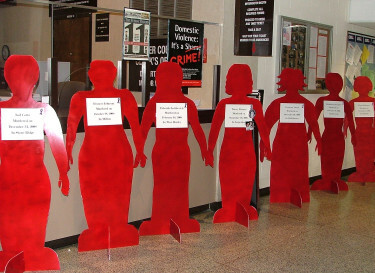 FAMILY Domestic Violence Services offers comprehensive services to persons affected by domestic violence. A 17-bed shelter for women and children in need of safe emergency housing. The shelter is handicapped accessible and has specialized children’s programs. Male victims can receive services at FAMILY’S other shelters. Survivors receive supportive counseling, case management and parenting services, school liaison services, help locating housing, and extensive referrals. The shelter is staffed 24 hours a day and is a drug- and alcohol-free facility. Residents attend groups and share in household chores. A multifaceted children’s program offering group and individual counseling, recreational and educational activities, and referrals. Domestic Violence Court Advocates, stationed both at Ulster County Family Court and the Kingston Domestic Violence Court, assisting survivors in obtaining orders of protection and emergency temporary custody of their children. Non-residential counseling, available to both former residents and women who have never stayed at the shelter. Child care is provided at no cost. Evolve, a behavior management educational group for men who have a problem controlling their anger. Services for lesbians and gays providing one-to-one counseling, shelter, legal advocacy, and support groups. We also provide community education, training, and consultation about homosexual battering and homophobia. Free clothing “boutique” provides donated items for residents and ex- residents of the shelter. Food pantry and holiday gift programs serve former residents of the shelter. Holiday programs are also provided for residents and former residents. Public education program supplies speakers on domestic violence and dating violence to agencies, schools, and community groups.